Legislature’s ‘make-up’ funding would still fall short, Sen. Janet Bewley claims. We check her math. Sen. Janet Bewley, D-Ashland, said funding boosts and increased revenue caps proposed for rural school districts by Gov. Scott Walker early in the 2017-19 budget process were deleted by the time the final budget was passed. We check her claim that the final budget represents a “broken promise” to rural schools. She is seen here at the State of the State address on Jan. 24, 2018. During his State of the State address, Gov. Scott Walker touted “historic” investments to K-12 funding in Wisconsin’s 2017-19 budget. However, state Sen. Janet Bewley, D-Ashland, immediately pushed back against Walker’s claim, decrying the budget’s “broken promises” to one particular area of education funding — sparsity aid — which benefits small rural school districts. “We lost more in sparsity aid and more in revenue authority because of the changes to the budget. The current plan to ‘make up for’ those broken promises costs our schools one full year and at least two-thirds of the sparsity aid that had been promised,” Bewley said in a statement on Jan. 24. Sparsity aid is aimed at helping school districts with 745 or fewer students and less than 10 students per square mile. These districts have fewer students and get less overall aid under the state funding formula, making the cost of educating each student more expensive. And some have uniquely high per-student costs for services, such as transporting students long distances to school, according to Tom McCarthy, communications director for the Wisconsin Department of Public Instruction (DPI). That is where sparsity aid comes in. Bewley said some school districts in sparsely populated northern Wisconsin have as few as 17 students in a graduating class. 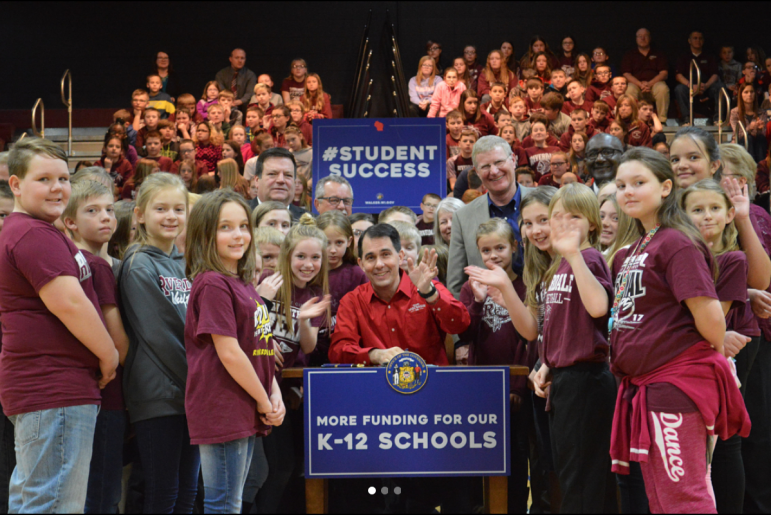 Walker’s original 2017-19 biennial budget proposal allocated an additional $10 million per year for sparsity aid, raising such aid from $300 to $400 per student and creating a second tier of the program for schools with 746 to 1,000 students at $100 per student. However, during the budget process, the Joint Finance Committee removed the increase and second-tier provision. After eliminating those, the committee added a provision that would allow districts to raise their revenue caps to provide some relief. Those additional funds would come from local tax dollars. Gov. Scott Walker signs into law additional funding for Wisconsin’s rural K-12 schools during a bill signing at Riverdale High School in Muscoda on March 12, 2018. State Sen. Janet Bewley, D-Ashland, argues the extra money still falls short of what these sparsely populated districts were promised in 2017. But the governor vetoed that provision. The final budget only included enough to fully fund the sparsity aid program as-is — $300 per student — and it provided no relief when it comes to the revenue cap. 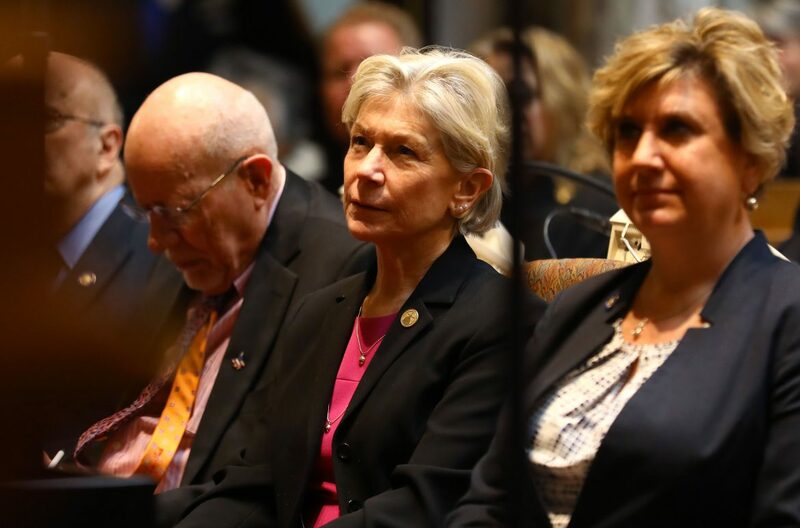 In January, Sen. Howard Marklein, R-Spring Green, and Rep. John Nygren, R-Marinette, sponsored Assembly Bill 835/Senate Bill 690 — which Bewley described as a plan to “make up for” broken promises. The Observatory did the math to see if Bewley’s “one full year and two-thirds of the sparsity aid that had been promised” estimates were accurate. We found that she was pretty close. The legislation, which Walker signed into law March 12, raises per pupil spending to the $400 level removed from the budget, but it does not create a second $100 tier. And schools won’t get any additional funding until July 2018. If sparsity aid increases had not been cut from the budget, they would have gone into effect July 2017 for this school year. Taking them out effectively costs schools one year of higher funding. The final budget did fully fund the current sparsity aid program, which had fallen short on cash in the prior year. In school year 2016-17, DPI could only afford to give schools $291.16 per student, or about $17.7 million statewide. After the budget passed, the program had more funding to keep up with the growing demand, spending $18.5 million this year — still falling a few dollars short of $300 per student. Thus, the budget did increase sparsity aid funding by $822,200 for school year 2017-18, and in the second year of the biennium, the budget allocated an increase of about $1.1 million. The new law provides another $6.5 million in sparsity aid in the second year of the biennial budget, according to estimates by the Legislative Fiscal Bureau. But it does not include the proposed second tier of funding for districts up to 1,000 students, which DPI estimated would have provided an extra $3 million in funding for an additional 31,000 students. Under the new law, Wisconsin will increase sparsity aid spending by $8.4 million in the current biennium. This is 58 percent less than the $20 million increase Walker initially proposed. Bewley had estimated rural schools would lose two-thirds, or 66 percent of the proposed new sparsity aid — overestimating the impact by about 8 percentage points. The measure also allows some school districts to raise revenue caps, a measure the governor vetoed from the budget. However, the law added a stipulation that this would not be available to districts in which voters had rejected increasing the cap in the previous three years. The revenue limit will add no extra state funding but does increase a local school district’s “revenue authority,” as Bewley mentioned. Regarding Bewley’s first claim, school districts did lose proposed increases to sparsity aid and the ability to raise their revenue caps between the proposed budget and the final budget. However, they did not lose any funding or revenue authority they already had under the last biennial budget. On the second statement, school districts will lose out on a year of higher sparsity aid funding and the ability to raise revenue limits even with the newly passed law — which takes effect one year later than these funding increases would have taken effect under the state budget. Finally, Bewley’s statement that rural districts lost sparsity aid between the initial budget proposal and the final budget was correct, but she was off in her estimation in the amount of the loss by about 8 percentage points. The Observatory rates Bewley’s claims as mostly true.